For anyone who might not be familiar with the case study house project, there was a magazine called Arts & Architecture with an editor named John Entenza that sponsored experiments in American residential architecture. The magazine would commission architects to design these experimental houses, which sounds like a dream for any architect! 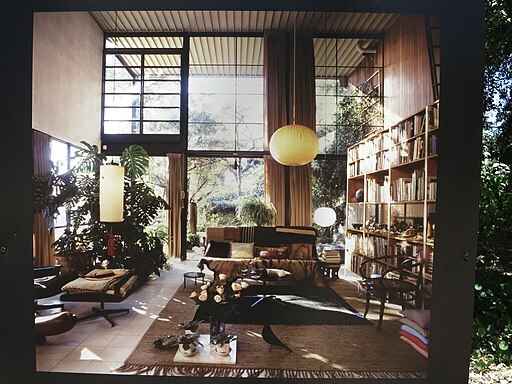 As the eighth case study house, Charles and Ray Eames were selected to design a home in Los Angeles, California in 1949. The site was donated to the magazine by a large estate and had a beautiful view out to the Pacific Ocean. During this time, Charles Eames was operating his architecture firm and designing products for manufacturers. His designs were influenced by modern architects and the industrial technologies being developed in manufacturing. When Eames designed the initial iteration of Case Study House 8, it had a different floor plan and structural design where the house was elevated above the ground on thin columns and rectilinear. This design was developed with Eero Saarinen and used pre-fabricated materials from catalogs with the intent of designing a house for mass production. Once the design was complete, the material order was placed, but it wouldn’t arrive for another three years due to the war. In this timeframe, there are various stories about what influenced both Charles and Ray Eames to redesign their house. Mixing two of my favorite stories, Charles and Ray Eames spent the three years traveling and enjoying some of their time in nature. This influenced their design to work harmoniously with the natural landscape rather than putting architecture at the forefront. In addition, they were able to visit and experience Mies Van der Rohe’s architecture which inspired their designs to follow a logical and organizational system. When we combine these two influences together, the final design of the case study house is set against a steep hill with a large retaining wall, which embeds it within the landscape. The design of the house is strongly influenced by the modern era of architecture. Lastly, the landscape around the house was carefully considered including Eucalyptus trees that have now grown large enough to hide the house from view. How much does the house cost? Whenever people talk about the Eames House, there’s an image of a high quality home for a very low cost. Decades after the Eames house was built, articles were written that describe the beautiful design of the house with a price tag of $1.00 per square foot during its time. In 2018, this would be about $10.25 per square foot. How can this beautifully designed house be so low in cost? First, let’s talk about some of the hidden costs of the house. The land, which was provided free of cost for the experimental house, is located in a prime area of Los Angeles. Then, there’s the retaining wall and slab on grade that were likely excluded from the price of the house. The $1.00 per square foot is the construction cost, which does not include the architect’s fees. Any sweat equity that went into the house by the architect’s team was not factored into the final cost. Supposedly, there was a lot of sweat equity by Charles and Ray Eames as well as their staff that went into assembling the house. Now, let’s talk about some of the low cost items of the Eames Case Study House 8. First, there was the prefabricated and ready off the shelf components that were delivered to the site. This includes the steel beams, roof joists, H columns, and so on. Everything that comes together to construct the house were all simple items to obtain. Once these items were delivered to the site, the assembly process didn’t take long because the foundation and retaining walls were already in place. In reality, the Eames Case Study House 8 likely costed more than $1.00 per square foot in its time or $10.25 in 2018 dollars. However, the simple design and construction process made this modern house an affordable alternative to the houses that were being developed and sold to the average consumer at the time. One of the reasons why Case Study House 8 wasn’t mass produced or recreated at a different site, as James Steele points out, is because the house was too future thinking for its time. In other words, Case Study House 8 was a different approach to housing that the people of its time weren’t used to seeing in their neighborhoods. Instead, the standard houses from the original kit house designs continued to dominate the housing market. “Experimental” houses such as Case Study House 8 remained an anomaly for its time as the housing market slowly evolved to new trends. Now that we’re half a century ahead of the time when Case Study House 8 was built, we’re at a point where society is ready for a new approach and aesthetic for housing. In fact, houses such as Case Study House 8 have an appeal that suggests it’s a higher standard of living, which means higher selling value and more. As an example, when we think of Philip Johnson’s house or the Farnsworth House by Mies Van der Rohe, we immediately think of a glamorous and expensive place. If the kit house of the 21st century can draw inspiration and emulate the Case Study Houses, there’s a higher potential market of consumers who are interested in this particular design. As a business model, if the design costs are higher for the initial prototype which can then be mass produced with slight adjustments and the construction costs remain low for every project, a kit house similar to Case Study House 8 can potentially be mass manufactured, constructed, and sold for a profit. Perhaps a kit house that’s between a modern house like Case Study House 8 and the standard kit houses that we see throughout all of the communities in America today would be an ideal start. With more time, this kit house can evolve and either become a new typology or go towards a contemporary aesthetic for the general population. I’m excited to continue researching for the next few weeks before I jump into brainstorming my first kit house project. Feel free to let me know what you think and if you’d like to share any additional resources! Stay tuned for more!